In 1983, the Finnish Greens became amongst the first Greens to enter parliament in Europe in a breakthrough which was a surprise for everyone, including the Finnish Greens themselves. However, the road from the direct action of the new social movements to the Parliament had been a long one. Sari Aalto unravels the roots of the Finnish green movement and how the Greens became a new group, and finally a party, in Finnish politics. Finland is a republic with a 200-member unicameral parliament and president as head of state. Members of Parliament are elected for a four-year term on the basis of proportional representation and there are several electoral districts in the country. Most of the political parties were established in the beginning of the 20th century when equal and common suffrage was introduced, and Finnish politics have since been dominated by the three or four biggest parties: the secular conservative National Coalition party (Kokoomus), the Social Democratic party (Sosialidemokraattinen puolue) and the Centre party (Keskusta, formerly the Agrarian party, Maalaisliitto). At the beginning of the century the fourth big party was the Swedish People’s Party (Ruotsalainen kansanpuolue), representing mainly the Swedish-speaking minority. After the Second World War the communists and others to the left of the Social Democrats formed a party called the Finnish People’s Democratic League (Suomen Kansan Demokraattinen Liitto) that became one of the biggest parties for next few decades. There was also a small Liberal party (Edistyspuolue, later Liberaalinen kansanpuolue). After the Second World War, Finnish politics was mainly dominated by the Social Democratic and Centre parties which were united by the idea of creating a Finnish welfare state. The social democrats’ demand for equality between classes met the Centre party’s demand for stable regional development in the country. Centralised planning by the State led to many reforms in the 1960s and 1970s in the fields of education, social insurance systems and public health care, made possible by ongoing economic growth. However, development was cut by the international oil crisis and the economic recession of the 1970s. Those who did not benefit from the development of the welfare state, mainly small farmers, founded the Rural party of Finland (Suomen Maaseudun puolue) which won a big victory in the 1970 parliamentary election. The other group which criticised welfare state politics was the young radicals mostly attached to a minority the of Finnish Communist party in the 1970s. During this time, political positions were stagnated in Finland, there was a very powerful president – Urho Kekkonen, Finnish president from 1956–1981 – and Finland was positioned in the neighborhood of the Soviet Union. The consensus politics of the social democrats and the centre, with the support of the Finnish People’s Democratic League and real or imagined Soviet demands, kept the National Coalition party out of government from 1966–1987. 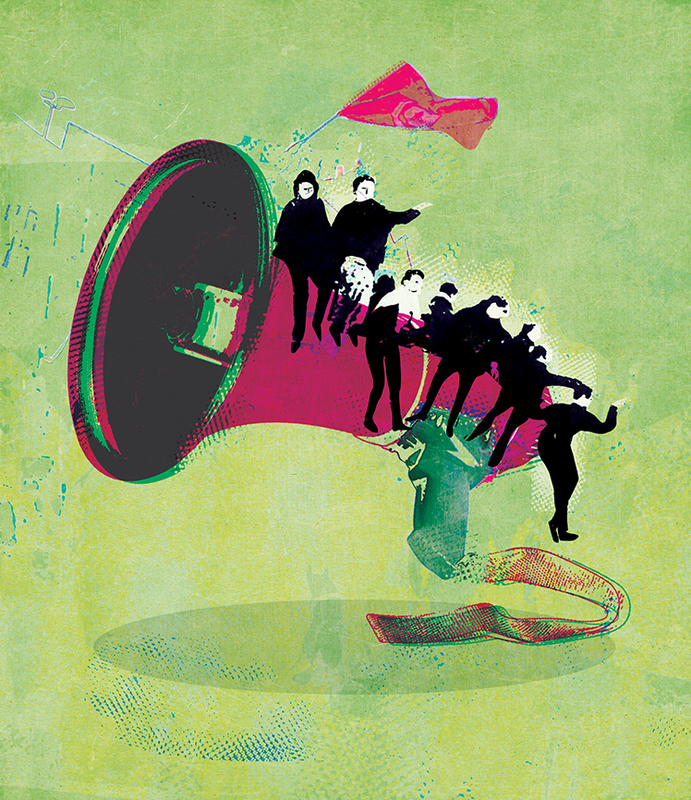 The roots of the Finnish green movement are in the new social movements of 1970s, although there was also some continuity from the 1960s when the cultural radicalism of the new Left flourished in Finland and new civil movements were founded. However, during the first half of the 1970s, many questions that had interested the radical youth were either marginalised or party-politised, left to the parties that were seen as the key actors in developing society. At the margins of society, a new kind of activity emerged in the early 1970s. In Finland, the critique of the Western materialist way of life and of a politics based on economic growth was similar to that of international hippie and ecological movements. Some young people in the country started to seek alternative lifestyles. One example was the association The Sprout Guardians (Oraan suojelijat), which established a vegetarian restaurant in 1974 in Helsinki, and which was also a new kind of working community. In Finnish society, ideas of sustainable lifestyle gained traction and there was growing environmental consciousness. The alternative movement unified around the idea that there was a need for new ways to live that were not based on continuous economic growth and exploitation of nature. Another new environmental movement started to gather around the mobilisation against nuclear power, with influences from Sweden and Germany, organising in the Energy Policy Association – Alternative to Nuclear Power (Energiapoliittinen yhdistys – Vaihtoehto ydinvoimalle EVY). The first mass demonstrations against nuclear power were seen in Helsinki in 1978. Small, youth-run newspapers were published to discuss environmental matters as well as peace and questions around the developing world and alternative ways to influence society. There were also feminist groups and ‘Third World’ solidarity groups which were non-aligned to political parties. One effort to influence parliamentary ways was the ecologically orientated Helsinki movement (Helsinki-liike), which included some activists from the youth organisation of the Liberal party, and which set up a list of non-party candidates for the 1976 Helsinki city council election. These different groups of the alternative movement came together in 1979, and the new movement emerged into the public debate. In April 1979, nature conservationists, activists, and radical youth travelled to Koijärvi, the famous bird lake in southern Finland, to stop the digging of a trench which would dry the lake. A new kind of activism was seen when young people chained themselves to the digger. The action at Koijärvi brought different groups into contact with one another, while other events in 1979 made these connections stronger. In July, the Nordic environmental camp was organised for the first time in Finland. A high point of the year, the one-week camp brought together the environmental activists, feminists and the alternative movement from Nordic countries to discuss the environmental, societal, and lifestyle questions in the forests of Inkoo, a community in southern Finland. The alternative movement unified around the idea that there was a need for new ways to live that were not based on continuous economic growth and exploitation of nature. A heterogeneous group of environmental activists, feminists, alternative culture activists, and global solidarity groups formed the core of the new movement and shaped its message. At the beginning of the 1980s, the non-aligned peace movement also got many activists from these circles. The alternative movement discussed in depth the best way to influence society. For most young people, personal solutions for living alternatively and direct action were the most effective ways to produce cultural change. For others, that was not enough. While most of the alternative movement activists were not linked to political parties, there were some (former) party members and activists who had experience of parliamentary politics, and it was from these circles that the idea to participate in the 1983 parliamentary elections arose. At the same time, there was extensive discussion in Finland of the international green movement that had emerged in several European countries. Environmental and green ideas were present in media and many parties sought a green image for their campaigns. After the demonstration in Koijärvi, the alternative movement had gone to the city council elections in Helsinki in 1980 and one of the movement’s leading figures, Ville Komsi, was elected. The list was named ‘the Alternative Helsinki’, but it was already publicly referred to as ‘green’. Similarly, the lists for the 1983 parlimentary election were also called ’green’ by the media following their establishment. As there was also a parliamentary election in West Germany at the time, Finnish alternative activists were afraid to be seen as little cousins of the Greens there that had already formed a party: Die Grünen. Finnish activists had no connections to Die Grünen and saw their project as a national one, but as the media had already dubbed the lists ‘green’, it seemed that the term could be the best route to success. To everyone’s surprise, the Greens got two seats in the Finnish Parliament, in the electoral districts of Helsinki and Uusimaa, the province in southern Finland. The disabilities movement had joined the green lists and the disabled activist Kalle Könkkölä was elected along with Ville Komsi from the alternative movement. The success of the Greens was a part of a larger protest against the old parties; political practices were largely criticised and there were accusations of corruption. The Greens had run in the elections in seven electoral districts, laying the basis for the larger green movement in every part of the country. The growth of the movement meant success in the next year’s municipal elections. If the take-off in the Parliament was a happy coincidence, the municipal elections were a breakthrough: a total of 101 Green representatives were elected to 50 city and municipal councils. Having two Green MPs meant a number of things: first of all, Ville Komsi and Kalle Könkkölä formed a Green group. They got some small funding from the Parliament which enabled the Greens to hire a group secretary (Pekka Haavisto in 1983, and Maiju Kaajakari in 1984–1987). The Green office in the Parliament became the official telephone number for the Greens in Finland. Secondly, the Finnish Greens started to gather in national meetings. The first one, which took place in May 1983 in Tampere, was called by Eero Paloheimo, who represented the older members of the movement. The media followed the meeting enthusiastically, but were interested in just one question: would the Greens form a party? For Greens themselves, the success had come quickly, and most were strongly against the idea of a traditional political party as parties were seen too hierarchical and centralised in terms of power. Instead, Greens wished to form an open network which would be able to hold on to basic green practices such as rotation and decision-making through open discussion. The green newspaper, Vihreä Lanka, was established as a platform for a green discussion. In national meetings, the conflicts within the movement came to light. At the meeting in June 1985, a Finnish radical nature conservationist and fisherman, Pentti Linkola, gave a speech to demand that Greens form a hierarchical and disciplined organisation to fight for human survival and to prevent ecocatastrophe. For Linkola and some of his successors, the green movement was the ecological movement and other questions like feminism, alternative social politics, and reforms of the welfare society should be removed from the green agenda. Linkola’s speech marked the formation of two wings in the Finnish green movement. The ecological wing was led by Eero Paloheimo and consisted of traditional nature conservationists and those activists who prioritised environmental issues. The social wing, whose ideologist was Osmo Soininvaara – the political secretary of the Green parliamentary group and the Green representative in Helsinki city council and board – saw social reforms as key to produce cultural and attitude change to prevent ecocatastrophe. The contradiction between these two groups concerned the ideological priority and the practices of the Greens; while the ecologists regarded rules and restrictions as necessary, the social wing emphasised softer methods. Discussion of organisation accelerated following Linkola’s speech. The most radical alternative Greens were against any organisation, but the social wing began to support some kind of organisation to prevent solo actions like Linkola’s speech. The ecologists, meanwhile, were mostly in favor of having a party structure. Most Greens, however, wanted some kind of compromise and organisation to make their work more effective. A little under two years after Linkola’s speech and the formation of the two wings, the Green League (Vihreä Liitto) was established in February 1987 as an association consisting of different green fractions and regional associations. Ecologists, the social wing and feminists all formed their own associations that became members. The establishment of the Green League marked the start of the real fight for power and ideological emphasis. The ecological wing pressured the Green League to register as a party, and were keen to strengthen their own position to set the ideological emphasis of the party on ecology. In 1988 the contradictions led to the formation of two Green parties: the most radical ecologists founded their own party and the Green League also decided to register as a party. In the years that followed, most Greens joined the Green League, which integrated both wings in the party , although the social wing had won. The party tried to preserve contact with the grassroots alternative movement but many radical activists were disappointed and unwilling to join the party. In comparison with their counterparts elsewhere in Europe, the Finnish Greens established a party relatively late: the West German Die Grünen was founded in 1980, the Belgian Green parties Ecolo and Agalev (today Groen) in 1980 and 1982 respectively, and Miljöpartiet in Sweden in 1981. That the Finnish Greens were the first of these to enter the national parliament was made possible due to the fact that there was no vote threshold for Finnish parliament. Die Grünen also entered parliament in West Germany in 1983 having crossed the five per cent threshold, while Miljöpartiet finally succeeded in crossing Sweden’s four per cent threshold in 1988. The reasons to oppose party organisation were historical: in the 1970s, Finnish society was party-politised and polarised in a way that alienated young people from parties, feeling that the atmosphere was stuffy and that it was impossible to speak freely without being associated with one ideology or another. For young people, the parties seemed to end all independent thinking and were hierarchical, patriarchal, and stiff. The events of 1978–1979 presented a key experience for the green younger generation, who sensed that there was again possibility for open discussion and to cross borders. For these reasons it was so important to find new organisational forms. As a party, the Green League tried to hold on to the principles of the movement: power was in the hands of the council of the member associations, and there was no board; rotation was practised, and the Green League’s chairperson could not be an MP; gender equality was important; meetings were open to all green activists, and statements were accepted in general meetings or meetings of the council. The Green League got its biggest victories in the elections at the beginning of 1990s. Ten Greens were voted into the Parliament in 1991, and over 300 representatives in municipal and city councils in 1992. After that, the Greens were taken more seriously. At the same time, the pragmatism of the Greens increased and some of the old principles were abolished. The Green League entered the Finnish government in 1995, which meant political responsibility and compromises. Today the Finnish Green party has 15 MPs and over 500 representatives in municipal and city councils. It has become more like a party, although traces remain of the original principles, for example its rotation rules differ from those of the traditional parties. In the media and in public debate, the Greens are usually primarily seen as an ecological movement, while the Green League strives to profile itself as a general party with opinions on every political subject. Right now, the growing worry about climate change seems finally to mean that cultural change is near, but it is less obvious whether this will materialise as high support for the Green League in the parliamentary elections this spring. The article is based on the author’s research of the history of Finnish green movement. The book Vaihtoehtopuolue. Vihreän liikkeen tie puolueeksi (Alternative Party. The Path from Green Movement to Green Party. Into: Helsinki) was published in May 2018. For example: the pacifist Committee of 100 (Sadankomitea); Association 9 (Yhdistys 9), which strove for gender equality; and Majority (Enemmistö), which promoted the interests of pedestrians and cyclists in the big cities.